The quality of double hung vinyl windows can differ greatly in the replacement window industry. Our focus, at Keystone Window of Pennsylvania, is to offer you the most energy efficient, durable, and beautiful replacement windows in your price range. Our Keystone Window of Pennsylvania windows are equipped with Vent Stop, a feature that limits sash travel yet allows for ventilation when activated. This useful feature keeps a window from being forced open while still allowing a fresh breeze to come in. Low-E (low-emittance) coating increases the energy efficiency of your window. This virtually invisible, microscopically thin layer greatly reduces the transfer of heat through your window by reflecting radiant heat back out of your home. Low-E coating is applied on the outside of the interior pane of glass so that the coating faces into the gap between the panes. Don’t buy windows without this basic energy efficiency coating, unless you’re just buying windows for a shed! Our IGUs (insulated glass units) are filled with argon, a nontoxic, nonreactive, clear, and odorless gas, to help reduce the heat flow through your window and into your home. 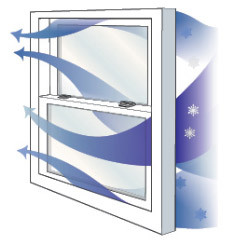 Some window manufacturers just fill their windows with plain air, which is a lousy insulator. It circulates in the sealed gap between the glass, conducting heat to the top while settling in cold pools at the bottom. Argon, however, is much more insulating and slower-moving than air, which greatly reduces the rate of heat transfer. Argon gas will make your windows more energy efficient and minimize condensation on the windows. These features are specific to our vinyl replacement windows. They increase the safety, energy efficiency, and convenience of our windows to keep you comfortable in your home. Always compare AAMA air infiltration ratings of any windows you’re considering purchasing. Poorly designed windows don’t have the built-in airlocks, weather stripping, and barriers necessary to keep air from forcing its way in. 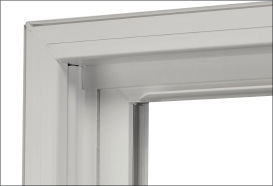 Without these design features, air will push between the sash meeting rails and around the sash perimeter where it meets the frame and sill. The last thing you need is a breeze coming through your closed window. We know how uncomfortable a home with leaky windows will be. So, we’ve loaded the our vinyl replacement window with weather barriers that go far beyond the industry standard and other manufacturers’ window designs to keep you comfortable. We want to help you reduce the cost of your energy bill. We have taken great care to ensure all of our glass packages exceed industry standards for energy efficiency. They also all reduce noise and fabric fading, and are warranted for a lifetime against seal failure. The National Fenestration Rating council (NFRC) label on your windows is specific to the overall thermal performance of the specimen window tested by NFRC. U-Factor: The industry standard is 0.30. To qualify for an Energy Star rating, the window must have a 0.30 rating or lower. The lower the rating, the better the energy efficiency of the window. Our windows range from 0.18 – 0.26 depending on the desired glass package selected and what insulating factors you are trying to achieve. The glass package, the window’s design, its components, and fiberglass insulation all affect this rating. Solar Heat Gain Coefficient: A measurement of how well products block heat caused by sunlight. The rating is expressed as a number between 0 and 1. The lower the number the better. Visible Transmittance: A measurement of how much light comes through the window. Expressed as a number between 0 and 1, the higher the VT the greater the window’s energy efficiency. Condensation: Resistance: A measurement of how well the window resists condensation on the glass. The higher the number the better. To keep your home as comfortable as possible, we install Dual-Fin, Wool-Pile weatherstripping around the perimeter of all sashes to fight air infiltration. 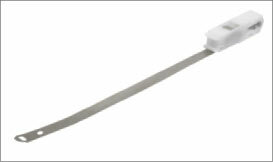 This weather stripping is one of the features that helps minimize drafty windows. If you’ve ever tried to close a double hung window, but couldn’t get it locked, you’ll really appreciate this window feature. 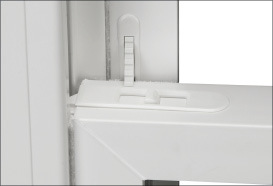 The Full Composite Reinforcement in the keeper rails ensures that you’ll be able to close the windows and lock them easily without fighting with them. The reinforcement also means maximum structural performance, so the meeting rails won’t sag. All keeper and lock screws are fastened into metal, not plastic. This makes our windows easy to lock tight, which helps keep your home safe. You will be amazed at how easily our double hung windows move up and down. Our Constant-Force Balance system is an AAMA Class 2 device that provides smooth and easy operation. The 1/2” stainless steel never needs lubrication or adjustment, making this window easy for you to use throughout its lifetime. 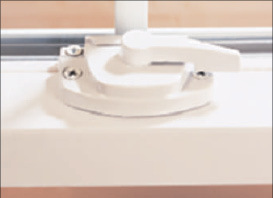 Your windows’ Cam-Action Locks will pull the sashes together, tightly sealing them to prevent air infiltration. When engaged, the lock increases the safety of you and your family by making the window much more difficult to be forced open. 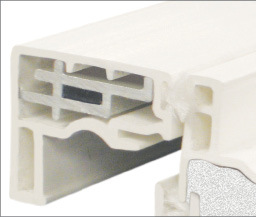 Multi-chambered sash and frame vinyl extrusions increase durability and insulation of the window. 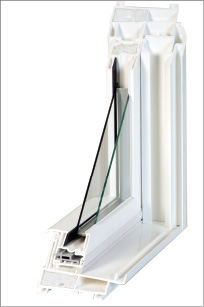 In addition, the chambers have fiberglass insulation inserts to make an even more energy efficient window. The sashes and frames in all of our windows are made using the finest quality, specially blended, un-plasticized poly vinyl chloride, or uPVC. Unlike wood or metal windows, your vinyl window frame will never rot or corrode. uPVC saves energy better than other materials, so it helps to reduce your household’s carbon footprint. In addition, it lasts much longer than wood or other materials, and never needs refinishing (so there’s no need to use environmentally harsh varnishes or stains.) This inherent durability means that the likelihood of having to replace your uPVC windows again in the future is much less than if you were to use wood or metal. We also fusion-weld the vinyl with top-of-the-line, robotic 4-point welding equipment to seal the corners of our windows. Fusing the vinyl ensures that the corners will never separate. Many low-quality vinyl windows today are simply screwed or stapled at the corners, just like wood or metal windows. Some are welded on very old, single- or double-weld machines. The corners of those windows can separate, and leak air and water. When choosing the best window for you, only purchase a window made with fusion-welded vinyl produced with robotic, 4-point welding equipment. We offer flat and contour grids in a variety of designs, colors and woodgrains. Now you can add style to your vinyl windows like never before! Your screens will be durable and easy to look through with strong, extruded metal screen frames featuring unobtrusive black fabric and matching black spline. Your choice of colors in the Keystone Window include Crème, Tan, Cocoa, and Bronze, and many more custom paints too.